Finds have been hard to come by since my great outing last Friday. 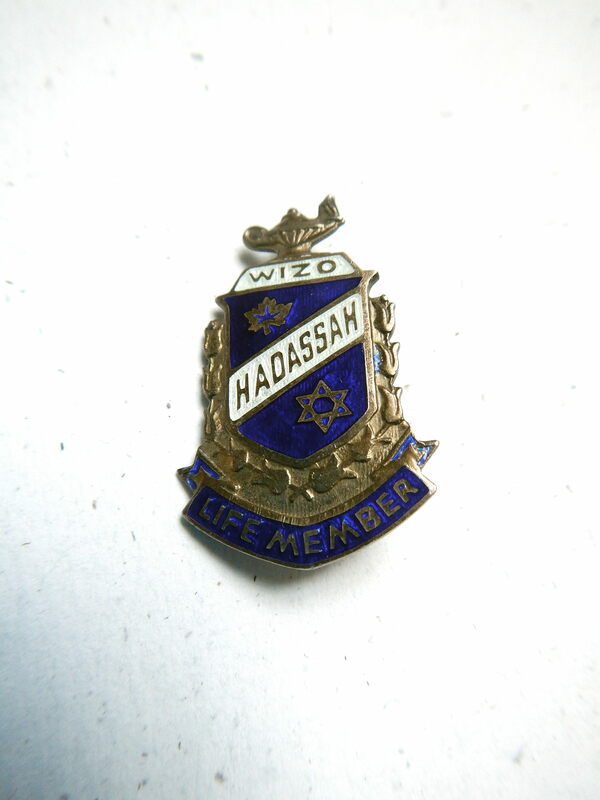 I found this sterling silver Hadassah-Wizo Lifetime Member pin in front of the same house as the silver dimes last week. Wizo Hadassah is (from their website): “Canada’s leading Jewish women’s philanthropic organization. Founded in 1917, CHW is non-political, volunteer driven and funds a multitude of programs and projects for Children, Healthcare and Women in Israel and Canada.” It’s probably worth around 60-70$ on Ebay. I brought home this crudely-made bracelet as well. I like it a lot, in fact I’m wearing it right now! Town of Mount Royal (Wednesday) was pretty unproductive. The highlight was when a woman saw me looking through her trash and offered me a stereo system and an old Nintendo set-up from her garage. The stereo system was composed of four big speakers, a cassette player, an amp and a record player. The latter two were non-functioning – a cut power cord and a broken belt / cartridge respectively – but I brought them to a local repair shop and sold them for 10$. The cassette player works fine but I haven’t had time to test the speakers. The Nintendo came with a collection of 12 games (including classics such as Duck Hunt, Super Mario 3 and Dr Mario) and the original controllers (including the Zapper!). There is a flashing red light when I plug it which is apparently a fairly easy fix. If I can get the machine working and bundle the games together it’d be worth more than 65$ on Ebay, though I’ll likely try to sell it locally. I’ve been feeling off recently and I think it’s partly due to a lack of exercise. Over the last year I’ve biked a lot, sometimes every day of the week and often for hours at a time. Since I gained the use of a car around a month and a half ago I’ve biked maybe five times total and have gotten barely any exercise. That has something to do with crappy weather and a crappy bike. However, it’s also because you need to keep driving when you find productive spots in faraway lands. 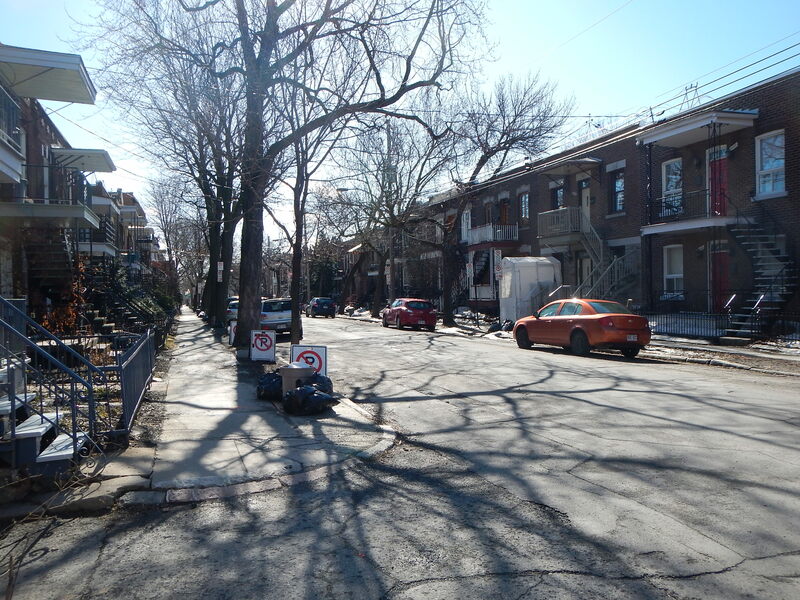 The car has allowed me to explore places like NDG, Westmount, Ville St Laurent and Hampstead more frequently but also means I have to return (and thus drive again) if I find a great spot. It can also be hard to resist using the car when you know there might be something out there that wouldn’t fit in a bike trailer. Realistically I’m going to want to continue to use the car for certain routes, especially more suburban ones such as Town of Mount Royal and Ville St Laurent. 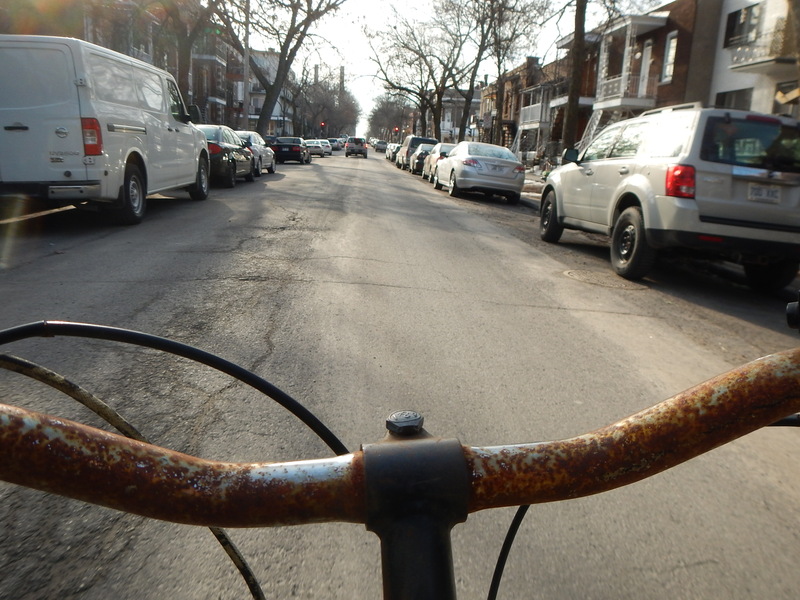 Still, there’s no reason why I wouldn’t use my bike for Rosemont, the Plateau, Villeray and Park Ex. I plan on getting a better, faster bike in the near future to make biking a little more fun – I bought my current bike mostly to get me through the winter. Yesterday I took the old rust-bucket out to Rosemont. 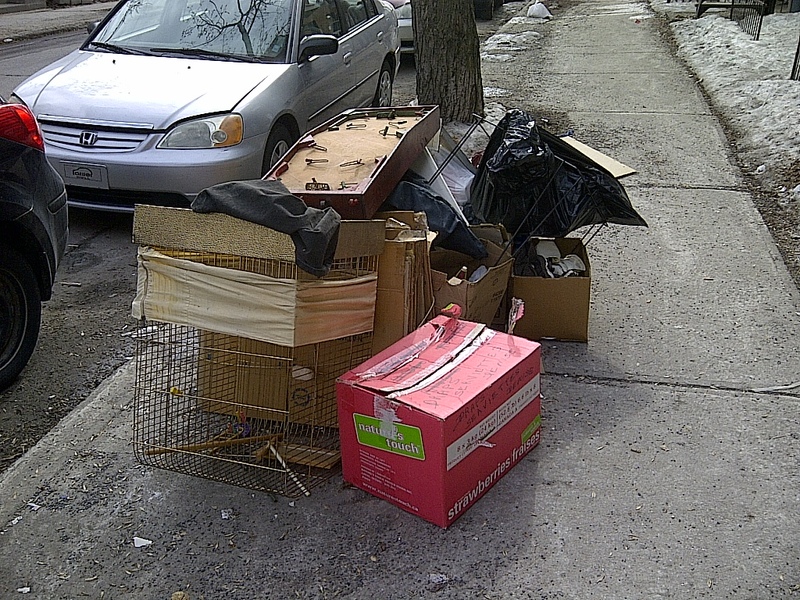 Finds were non-existent before coming to this spot in front of an apartment building on Casgrain. I noticed an odd-looking contraption sitting on top of the pile. I asked a janitor what the deal was and he told me it had all come from the basement. My guess is that these things were in storage for a long while and were tossed as part of spring cleaning. 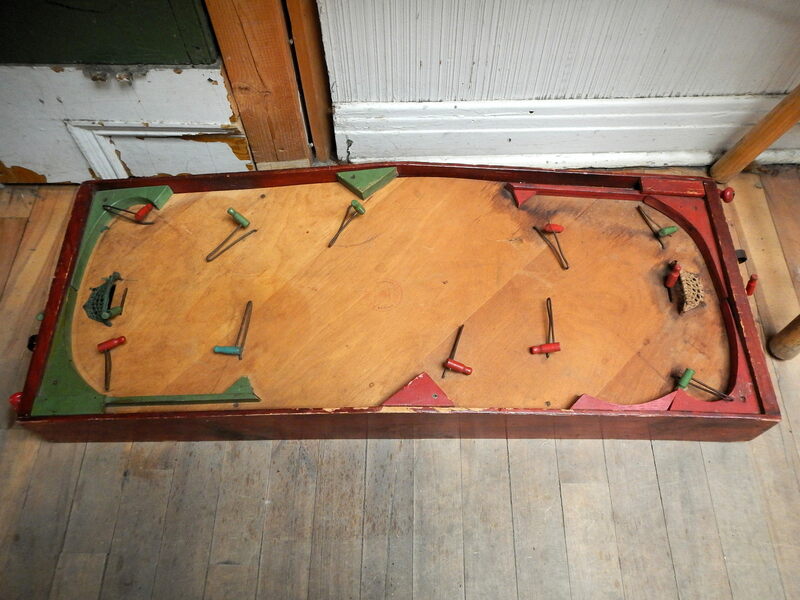 The contraption turned out to be an old wooden table hockey game. The middle is high with the board slanting downwards towards the goals on both ends. There’s a pinball-like spring on each side made to launch the puck. 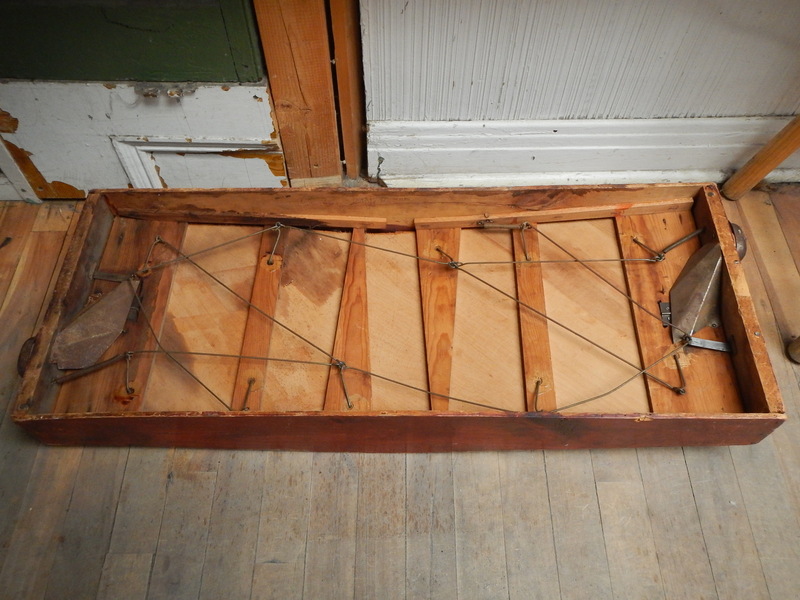 The “players” – the wires with wood pieces on the end – are controlled by a single lever on each end of the game. Some of the wires are bent out of shape but I imagine they wouldn’t be too hard to fix. The goalie is controlled individually. It looks crazy but the game still works as it should. It was built to last. Two stamps on the inside are dated February 20 and May 27 1947. 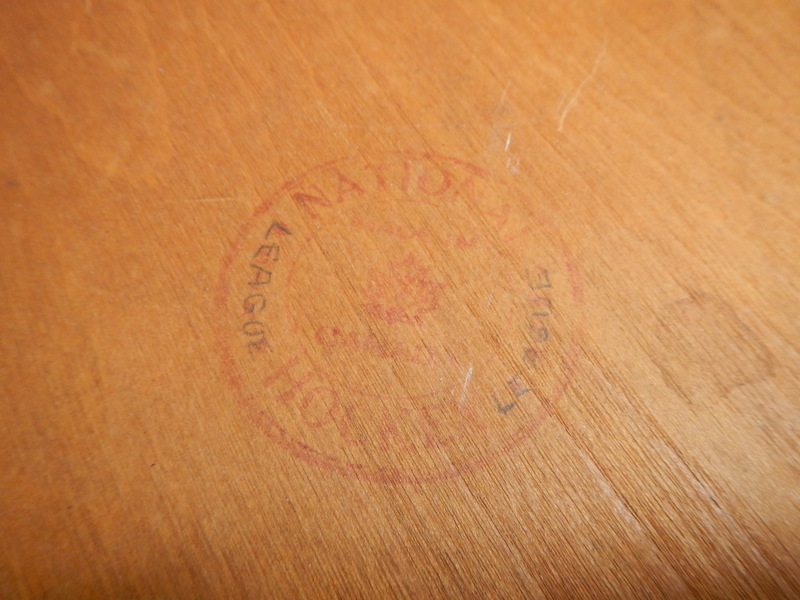 At the centre is a stamp that says “National Hockey”, “Made in Canada” and another two words covered up by the pencilling in of the word “League.” The pencil likely just covers up the faded ink print of the same word. I did a bit of research. 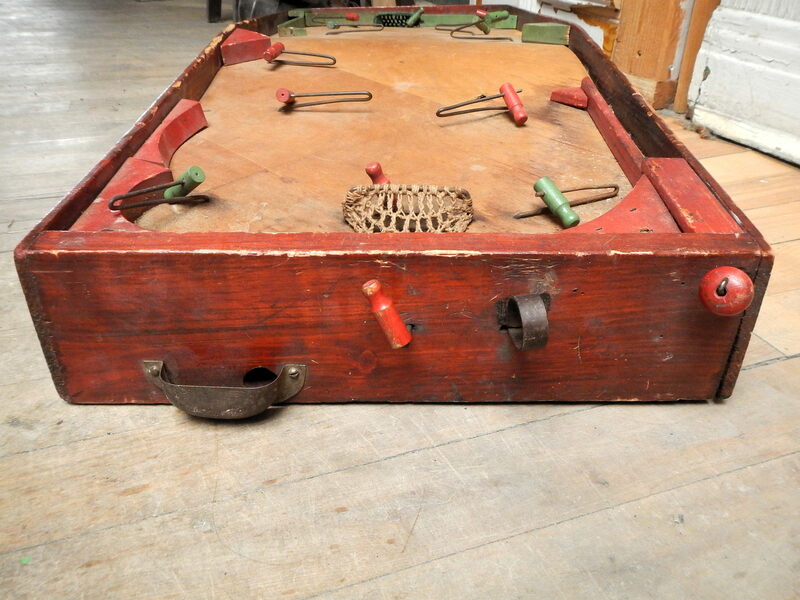 This game was made by Munro and sold by Eaton’s between 1940 and 1955 and has a bit of collector’s value. This one, a bit more modern (1953) and less crude than mine is selling for 180$. More similar to mine is this one selling for 190$. 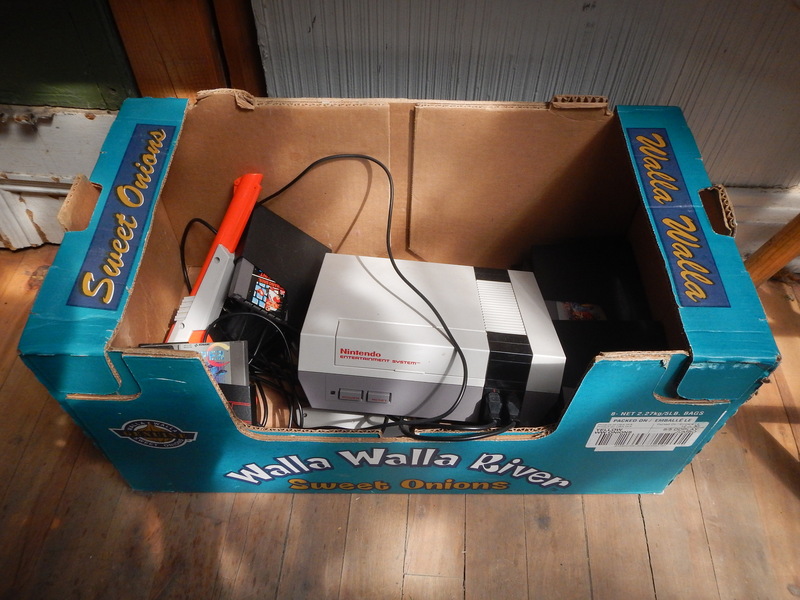 An exact match in terms of years but in somewhat better condition is selling for 270$, though from what I can tell this might be a bit of a reach. Mine has a few issues which are likely easily fixed but is otherwise in very good condition. I think it would sell for at least 100$. It’s a great piece that I likely wouldn’t have noticed if I had been driving. I found three working bike locks and a bunch of bike parts in front of this house last week. 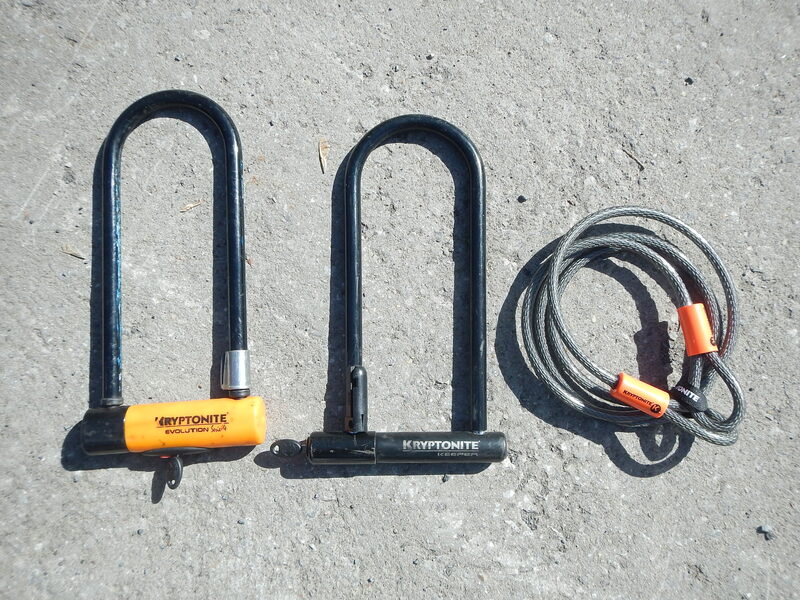 Today I found… three more bike locks! The orange Kryptonite Evolution Series 4 sells new on Ebay for around 70$ plus shipping. There was another lock but couldn’t find the key, I wonder if there’s a way to make a new one? There were also more parts, including a set of tire levers, a pump, and two brand new inner tubes. As a cyclist I like having extra locks for a theoretically time in the future when my current locks break and I have to spend money to get a new one. Still, I now have seven bike locks above the two I currently use and that’s a bit excessive. I saw this bike as I was heading home. 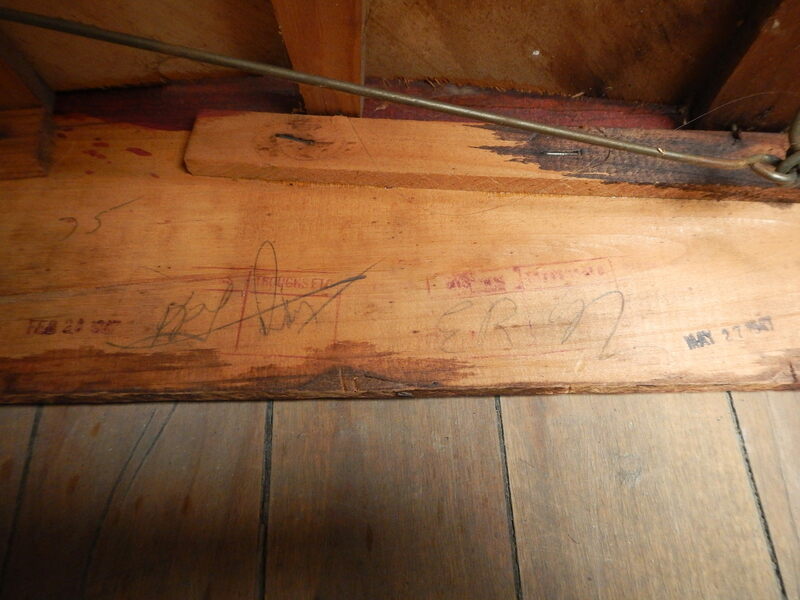 It looks like it had been in storage for a while. The frame (a Finelli) isn’t fancy and the tires are flat but it seems in good shape otherwise. I’m going to bring it down to the co-op to see if it’s worth fixing up and if not I’ll donate it for parts. I had a yard sale with a friend on Sunday which lasted only a couple of hours before the police showed up asking for permits. We had set up in front of a friendly depanneur (a convenience store here in Quebec) that had given us permission to do so. They gave me a warning and told me next time would be a 200$ fine. My place is in a pretty terrible location for yard sales which makes getting a permit pointless. It makes me wonder what I’ll end up doing this summer in terms of public sales. I might have to start going the bazaar route. Anyway, on the plus side I still managed to net 125$ on the day which made it all the preparation worthwhile! That’s all for now. I’m going out later to check a productive place in the Plateau but otherwise I’ll be taking the next few days off. I might skip Monday’s route (all fairly mediocre) to work on organizing, getting some stuff on Ebay, and maybe working on my bike. 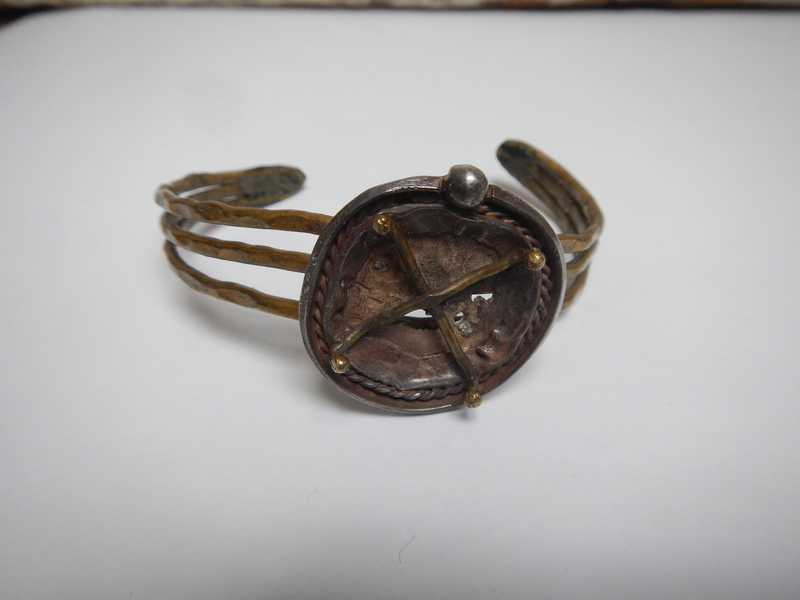 That crudely-made bracelet is fascinating. It looks like there might have been a large stone of some kind in the centre. What kind of metal is it? Is it heavy? 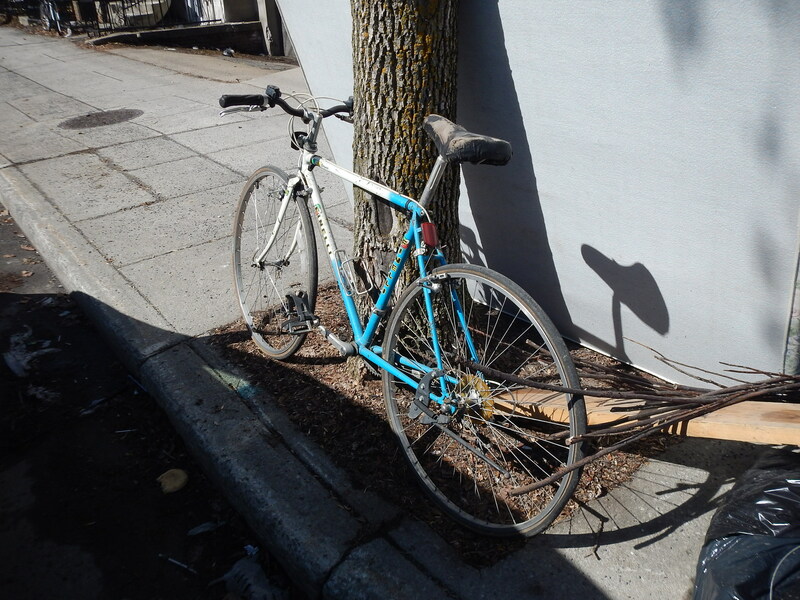 Judging from the handlebars, that’s one rusty-looking bike you have there! Are you thinking of keeping the Finelli yourself? You have bike locks coming out the wazoo. Mine’s not missing any parts. I think I’ll try to sell it for 150$. 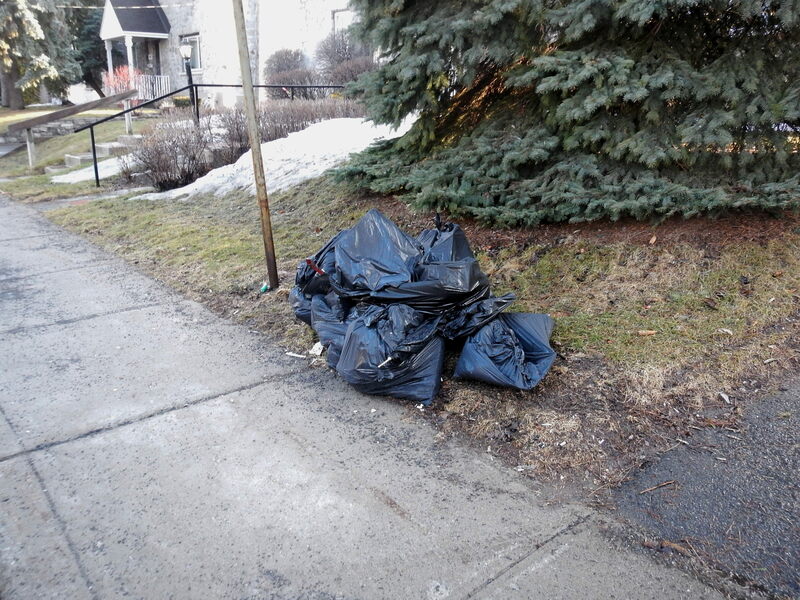 I love your blog.Read it often.This week,I find that your finds are not great.As you say,there can be dry spells even during spring cleaning season.I am happy you are going to TMR,Westmount,NDG and Ville St.Laurent.You should also go to the three southern boroughs,Verdun,LaSalle and Sudouest(comprising of Ville Emard-Cote St.Paul and St.Henri-Little Burgundy-Griffintown).These are populous areas but they seem to be off your radar. I’ve been following for over a yr now. I love to see and read what you’ve been up to. In 2013 I rode a bicycle and walked a great deal because I had no car. My sister loaned her car to me for a bit and my fitness activities dropped off. I’ve always found it hard to maintain walking & riding when there’s a car involved! Hope your riding improves. It makes a huge difference to physical and mental state.